Shopping Express®: return tickets on the luxury coach service from central Dublin to the Village. 10% saving: VIP Card providing further savings on purchases throughout the Village. Two-course lunch: at L’Officina restaurant. €50 Gift Card: can be used in the boutiques of your choice in Kildare Village. (Gift Card available for Adult packages only). From €85 per person, this exclusive Kildare Village Shopping Package offers a unique, value added day out with up to 60% savings. A full day with return tickets on the Shopping Express®, the luxury coach service from central Dublin to Kildare Village, a two course lunch in the L’Officina restaurant, a VIP Day Card and a €50 Kildare Village Gift Card. Purchase your Kildare Village Special Offer Package here online. To redeem the Package, please present the confirmation email you will receive at the Shopping Express® departure point, and again on arrival at Kildare Village visit the Tourist Information Centre to receive your VIP Day Card, Gift Card which takes 48 hours to process and therefore cannot be redeemed within that time,and Lunch Voucher. Visit L’Officina Restaurant at Kildare Village where you can exchange your voucher for a two course lunch. Additional courses and beverages will be subject to charges in the restaurant. Provides 10% off all purchases on the day of visit to Kildare Village. The VIP Day Card is valid only for Kildare Village has no cash value and is for personal use and non-transferable. The VIP Card cannot be used for previously made purchases and is not valid in conjunction with special offers, on already reduced prices or as part of special offers. A €50 card to spend in any outlet at Kildare Village. Please note the Gift Card is only available for adult packages. The Irish National Stud, Horse Museum and Japanese Gardens: all-access entry pass. €20 Gift Card: can be used in the boutiques of your choice in Kildare Village. (Gift Card available for Adult packages only). Enjoy a wonderful day out of shopping and discovery at Kildare Village with this exclusive package for just €43 per person. This special package includes a VIP Card* providing further savings on purchases at boutiques of your favourite international and designer brands throughout the day as well as a €20 Kildare Village Gift Card which can also be used in any boutique of your choice. You will also receive an all-access entry pass to The Irish National Stud, Horse Museum and Gardens, home to some of Ireland's finest thoroughbreds, and be able to wander through the beautiful Japanese Gardens, considered the finest of their kind in Europe. The package includes return tickets on the Shopping Express® luxury coach service from central Dublin to Kildare Village for stress-free, comfortable travel at the beginning and end of this unmissable day. The world-renowned Irish National Stud is home to some of Ireland's finest thoroughbreds and also home to the beautiful Japanese Gardens, considered the finest of their kind in Europe. Visitors can also travel through an underground stone passage to experience St Fiachra's Garden and visit the horse museum, where the interesting history of Ireland’s long-standing relationship with horses is explored and the paraphernalia of riding through the ages is displayed. A complimentary daily shuttle bus runs from Kildare Village to the Irish National Stud. Purchase your Kildare Village Shop & Explore in Kildare Package here online. To redeem the package, please present the confirmation email you will receive at the Shopping Express® departure point, and on arrival at Kildare Village, visit the Tourist Information Centre to receive your VIP Card, Kildare Village Gift Card and entry pass to the Irish National Stud, Horse Museum and Gardens. The VIP Card entitles you to 10% off all purchases on the day of your visit to Kildare Village. The VIP Card is valid only for Kildare Village, has no cash value, is non-transferable and is for personal use only. The VIP Card cannot be used for previously made purchases and is not valid in conjunction with special offers or on already reduced prices. A €20 Kildare Village Gift Card to spend in any boutique at Kildare Village. Please note the Gift Card is only available for adult packages. The Irish National Stud, Horse Museum and Japanese Gardens: all-access entry pass for two adults. Hands-free shopping:you shop, we collect. Enjoy a wonderful day out of shopping and discovery at Kildare Village with this exclusive package for just €83 for two adults. This special package includes a VIP Card* providing further savings on purchases at boutiques of your favourite international and designer brands throughout the day as well as a €20 Kildare Village Gift Card each, which can also be used in any boutique of your choice. You will also receive an all-access entry pass to The Irish National Stud, Horse Museum and Gardens, home to some of Ireland's finest thoroughbreds, and be able to wander through the beautiful Japanese Gardens, considered the finest of their kind in Europe. Enjoy the pleasure of carefree shopping with complimentary Valet Park & Wash and hands-free shopping. The Irish National Stud, Horse Museum and Japanese Gardens: all-access entry pass for two adults and up to four children (under 16). Enjoy a wonderful day out of shopping and discovery at Kildare Village with this exclusive package for just €87 for a family. This special package includes a VIP Card* providing further savings on purchases at boutiques of your favourite international and designer brands throughout the day as well as a €20 Kildare Village Gift Card for each adult, which can also be used in any boutique of your choice. You will also receive an all-access family entry pass to The Irish National Stud, Horse Museum and Gardens, home to some of Ireland's finest thoroughbreds, and be able to wander through the beautiful Japanese Gardens, considered the finest of their kind in Europe. Purchase your Kildare Village Shop & Explore in Kildare package here online. To redeem the package, please present the confirmation email you will receive on arrival at Kildare Village, visit the Tourist Information Centre to receive your VIP Card, Kildare Village Gift Card and entry pass to the Irish National Stud, Horse Museum and Gardens. 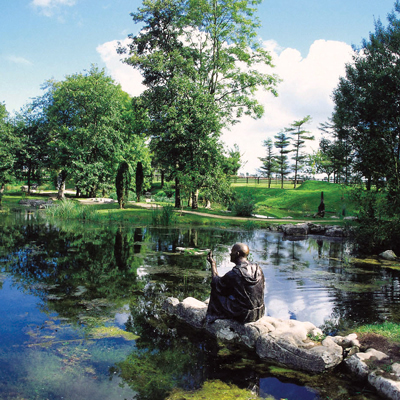 Family admission to the Irish National Stud and Japanese Gardens for two adults and up to four children. Shopping Express®: return tickets on the luxury coach service from Dublin Airport to the Village. 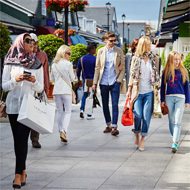 From €95 per person, this exclusive Kildare Village Shopping Package offers a unique, value added day out with up to 60% savings. A full day with return tickets on the Shopping Express®, the luxury coach service from Dublin Airport to Kildare Village, a two course lunch in the L’Officina restaurant, a VIP Day Card and a €50 Kildare Village Gift Card. Purchase your Kildare Village Special Offer Package here online. To redeem the Package, please present the confirmation email you will receive at the Shopping Express® departure point, and again on arrival at Kildare Village visit the Tourist Information Centre to receive your VIP Day Card, Gift Card and Lunch Voucher. 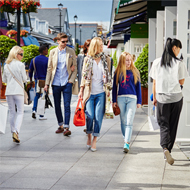 A €50 card to spend in any outlet at Kildare Village. Please note the Gift Card is only available for adult packages which takes 48 hours to process and therefore cannot be redeemed within that time, . Children's Workshop with Imaginosity: two-hour access (suitable age 4-9 years) from 11am to 1pm. 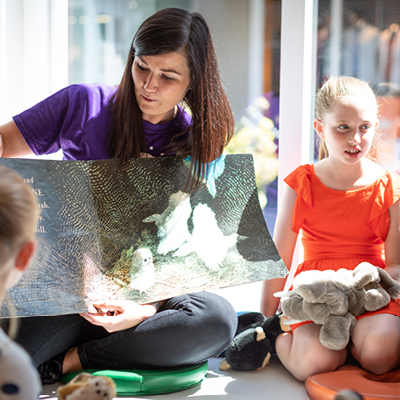 Children's Workshop with Imaginosity: two-hour access (suitable age 4-9 years) from 1pm to 3pm. The workshops are suitable for children aged 4-9 who must be toilet trained. Allocation is on a first come, first served basis and should be booked online the day prior to visit.